No medical advances inspire more media hyperventilation than do those in aging research. Terms like “life extension” reek of snake oil, and despite our frequent forays into wishful thinking, we know in our bones that this stuff is the impossible dream. Aging’s daunting complexity, coupled with the fact that neither the drug regulators nor the medical establishment regard it as a malady worthy of treatment, long insured that pharmaceutical companies kept their distance from the antiaging business. Biotech’s scientist-entrepreneurs, however, are made of dreamier stuff than Big Pharma executives, and as gerontology began applying the sharp tools of molecular biology to aging, the field’s young visionaries began knocking on venture capitalists’ doors with business plans promising drugs that would block the root causes of aging. But these early efforts to apply the emerging insights of modern biogerontology” never came close to realizing their founders’ high hopes. Then a miracle happened: Gerontologists began getting hints that all animals, including humans, are born with genetically-encoded systems that can slow aging. By the late 1990s it was clear that certain mutations can switch on these hidden, rarely activated systems and such “gerontogenes” were shown to dramatically extend lifespan in roundworms, fruit flies and mice. This startling discovery has transformed the antiaging quest. It means scientists no longer need a detailed understanding of the impossibly complex aging process in order to retard it – they need instead to activate the evolutionarily ancient antiaging system we carry in each of our cells. Thus, for the first time medicines that put a brake on aging are clearly on the horizon. The Youth Pillmakes the case that they’re coming at us faster than a hardheaded person who’s been around the block a few times would think. And in their wake will come profound effects on our lives, the economy, the practice of medicine, the drug industry. Writer and science reporter David Stipp covers the burgeoning field of biogerontology and he tells the tale of the the race to develop antiaging drugs that convey the command “slow down” in the ancient language of the genes and proteins that regulate the aging process. If researchers can learn to mimic that command, they’ll revolutionize medicine. scientific detection and commercial innovation and change the way we think about our lives and our health. 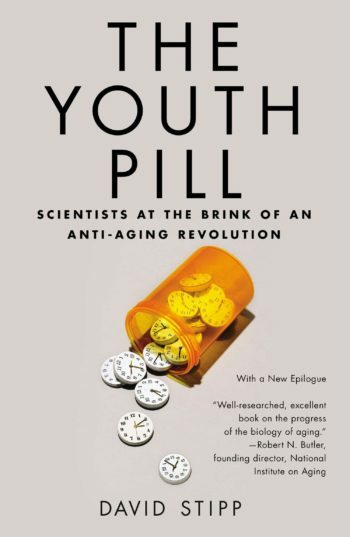 The Youth Pill, by David Stipp offers a fascinating look at breakthroughs in anti-aging science. Mr. Stipp, deftly connects the dots among a disparate cast of scientists and their research efforts, involving antioxidants, rodent studies, red wine and long-lived animals, among other topics. … In short, a wonderful read. Improvements in technology, particularly the ability to sequence DNA quickly, have made the serious study of ageing possible. All this is carefully chronicled in The Youth Pill by David Stipp, a former medical writer for the Wall Street Journal and an able guide to this young science. … a thorough, investigative overview on the whole field of gerontology and its expanding frontiers. From the history of attitudes and philosophies on old age and various nostrums that have been pitched to the hard science of the cellular mechanisms of aging, genetic studies, and dietary variables and finally to what is becoming the big biotech business of life extension, Stipp covers the field admirably.